My 8 year old did everything from start to finish, she drew out the shapes, cut out the pattern and the fabric pieces. 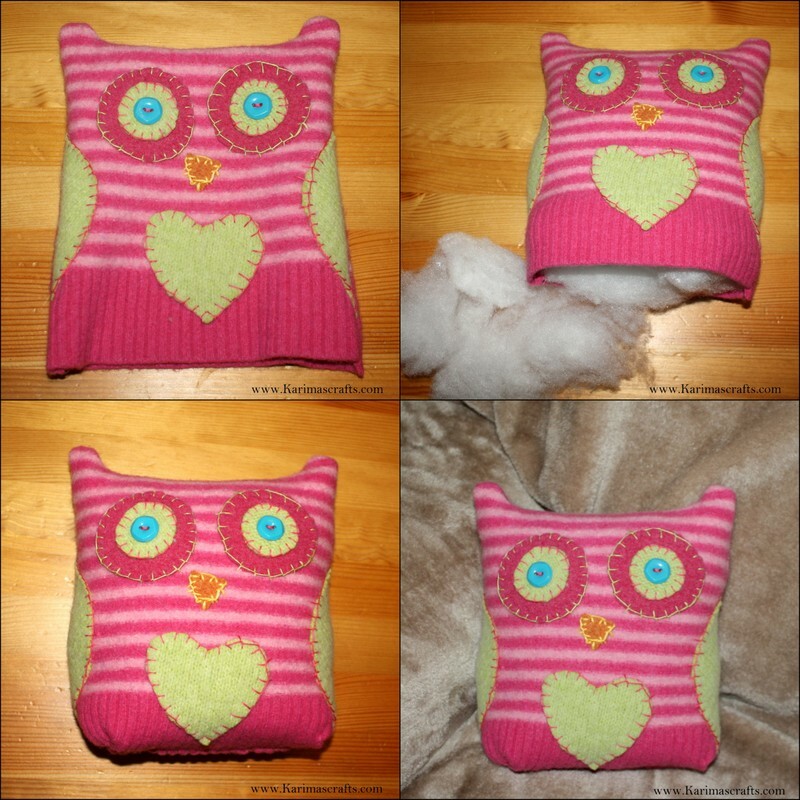 She did all the hand sewing and even finished the cushion off using the sewing machine. So it really is quite easy to do as you will see hopefully. 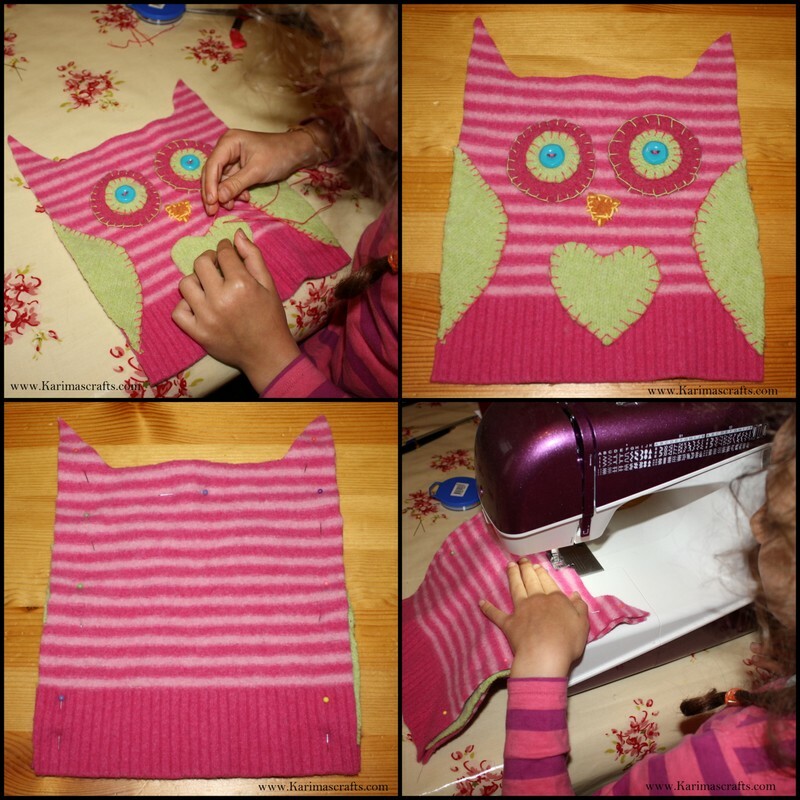 We used upcycled wool jumpers that we had felted by washing hot and tumble drying several times. Step 2: Then draw out the eyes, nose, wings and my daughter wanted a heart in the middle. 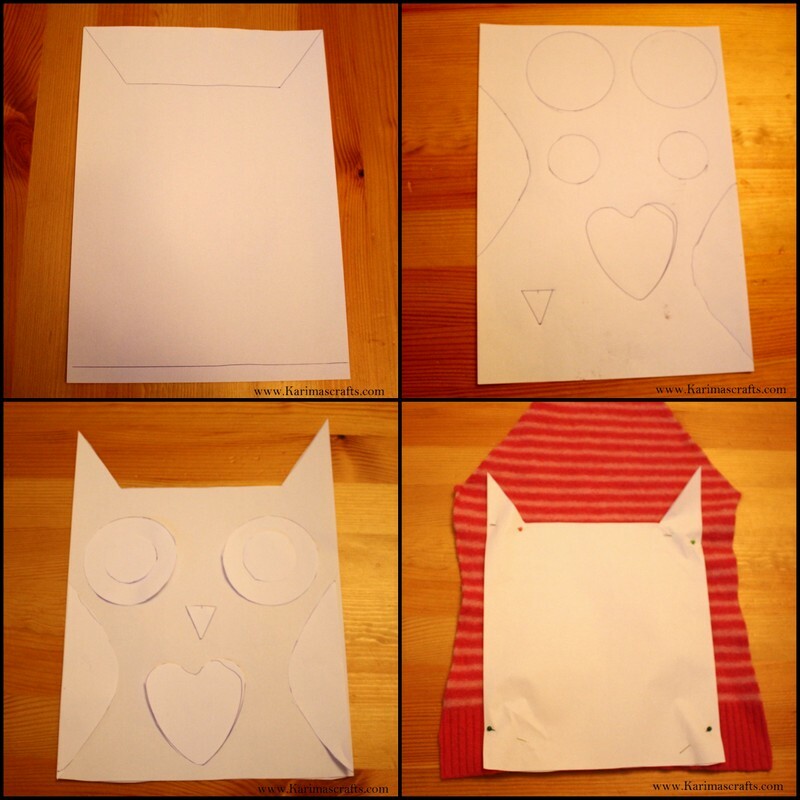 Step 3: Make sure the size of the parts fit nicely by cutting all paper patterns out and placing them on the main owl shape. If not adjust accordingly. 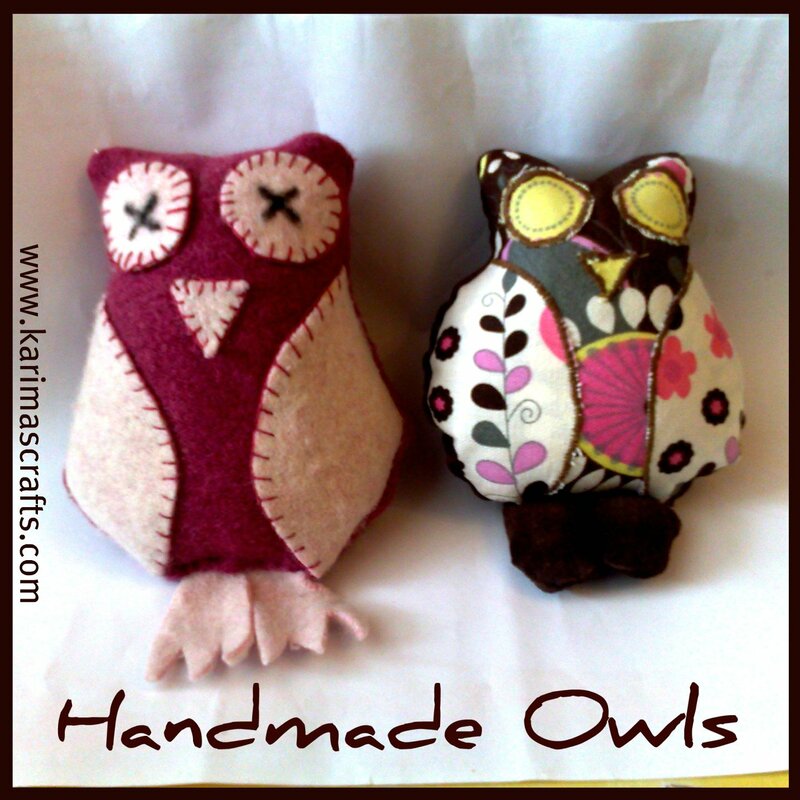 Step 4: Place the owl cut out onto the fabric and pin in place. 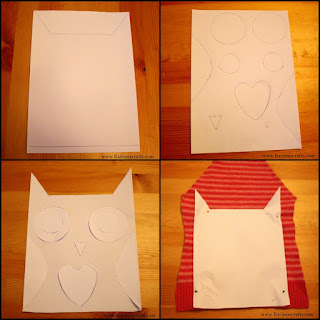 Step 6: Again makes that all paper pattern pieces will fit the cut out owl. Step 7: Place the pattern pieces onto your other fabric and cut out all the pieces. Then place onto the main owl fabric to make sure that you are satisfied with your design. 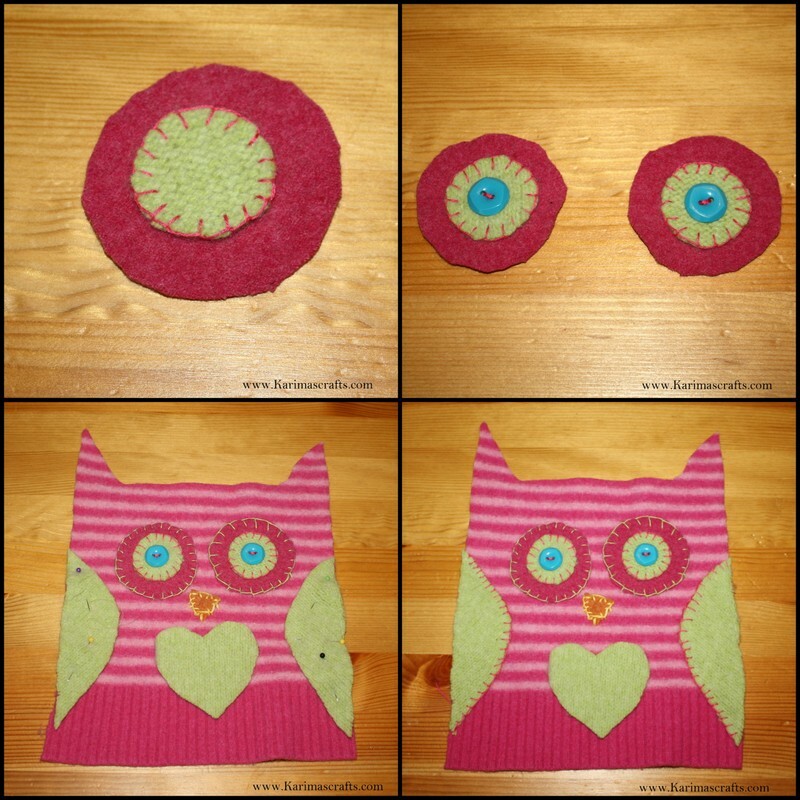 Step 8: Start sewing the middle of the eye to the outer eye using blanket stitch. Step 9: Attach the button if using onto the centre of the eye. Step 10: Repeat this step by making the second eye. Step 11: Attach the eyes using blanket stitch onto the main owl fabric. Then attach the nose by stitching too. Again place all pieces over the fabric to make sure they are still all fitting nicely. 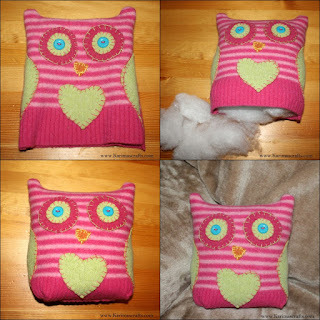 Step 12: Attach the wings using blanket stitch. 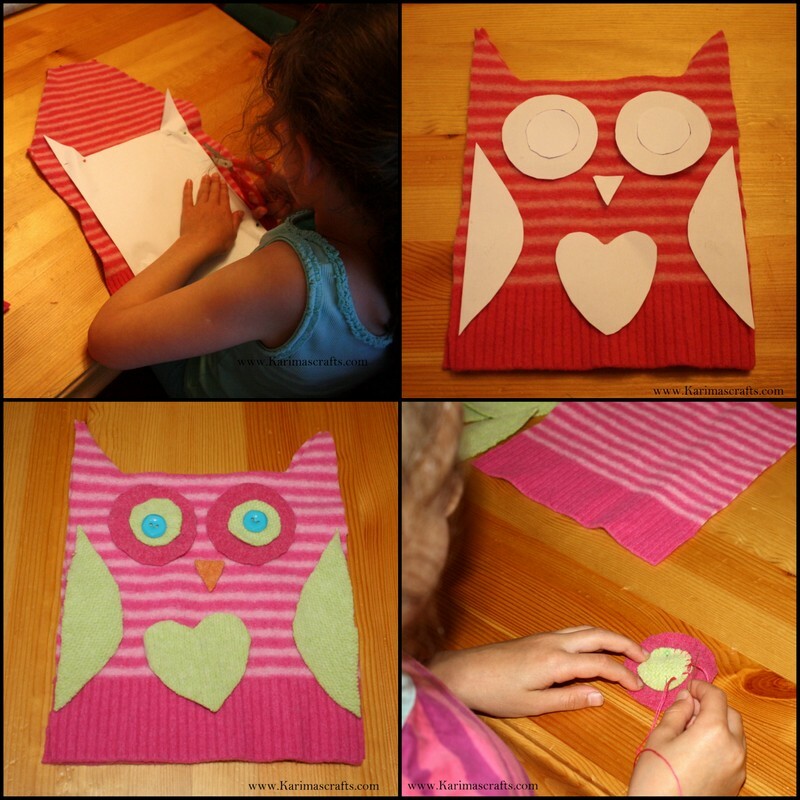 Step 13: Attach the heart shape by blanket stitch. That should be all pieces attached. Step 14: Place the other cut out owl piece and place it onto the the finished sewed owl piece. The owl design needs to be inside. Step 15: Pin the piece together ready to sew with the sewing machine. You could do this by hand if you wished. Step 16: Start sewing all around the edges. Leave an opening on the bottom so that you can turn it inside out. Step 17: Turn the sewed cushion inside out so that you can now see the front of the design. You may need to press inside for the ears to be shown. Step 18: Now fill in the cushion with wadding in the opening that you left. Step 19: Hand sew the opening at the bottom to secure the cushion. 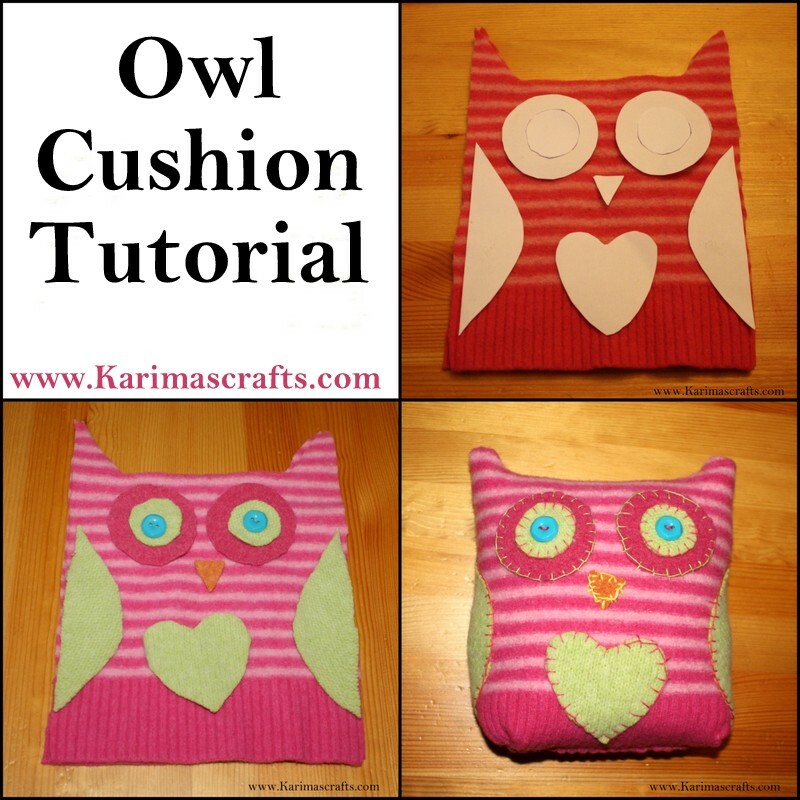 Step 20: You can now gift your cushion or find a nice comfy place for it to reside! What a talented daughter you have MashAllah! Such talented Young ppl are like a breath of fresh air amongst the wifi-obsessed new generation.